The cut-price tariff negotiated between Origin and FRV for the 100MW Clare solar farm is not quite what it seems. Still, the outlook is good for solar – both large scale and rooftop – in Australia. Despite what you might read in investment bank research reports or the daily business newspaper, wind energy economics are presently still a touch ahead of solar. The latest power purchase agreement (PPA) signed by Origin Energy for the development of a major 100MW solar farm in north Queensland may be not quite what is claimed. However, given that solar will attract higher spot prices during the day, and given the falling cost of debt, solar is looking a better deal than ever, both in large installations and on rooftops. We thought we knew a little bit about the cost of building new solar and or wind power stations. After all, there are now 5GW of solar PV installed and about 4GW of wind across Australia. Therefore we were intrigued, and more than a little excited, to see the largest electricity retailer in the land, Origin Energy, publish the chart below as part of its presentation to last week’s Macquarie Equities investment conference. The Australian Financial Review, not previously known for showing any empathy towards renewable energy and generally taking at its kindest a “none of our business” attitude towards climate change, wrote a glowing piece calling CEO Grant King, “the Sun King”. Your author is fully in favour of the renewable revolution – we wouldn’t be here otherwise – and if Grant King is going to become Australia’s Sun King, so much the better. However, it’s a maxim in the markets that “if something looks wrong, it probably is wrong” and these PPA prices looked wrong to us. A broader view suggests caution. The overall industry data still supports a view that wind should be a touch cheaper than solar. The Australian Renewable Energy Agency recently released details on 70 projects that had applied for grants in relation to utility solar PV plants. That data clearly showed that wind capacity factors are about 17 per cent higher than solar and cost to build is about 8 per cent lower. Opex is probably a touch higher for wind. Those numbers aren’t the end of the story. The timing of solar output is more predictable than wind. At the moment, the black price (wholesale price) for solar is likely to be higher than for wind, as wind output tends to be overnight when demand is low and solar output comes in the middle of the day in the high part of the daily demand curve. Still, in ten years time when there is another 20GW of solar across Australia, solar may have its own negative pool price correlation. Is Origin gilding the lily thanks to ARENA grants? Neither Origin or FRV have provided any detail on either the cost or the projects or the PPA price for the 100MW Clare solar farm that attracted all the headlines. Still we put together the attached table that summarises the two projects – both Clare and Moree. FRV hardly put a dollar of its own money into Moree. Basically, virtually 100% of the equity in that project came from ARENA with the debt from the Clean Energy Finance Corporation. This means that any PPA it wrote was going to be at a profit. The project is up and running and on budget so its de-risked. In turn this meant that FRV likely could afford to write an “out of the money” PPA with its Moree partner Origin. To put it bluntly, the profit on Moree likely subsidises Clare. We put together a fairly simple net present value model for Clare and calculated the Internal rate of return (IRR). IRR is the interest rates that makes the sum of the time weighted (discounted) cash flows of the project zero. If the IRR exceeds the weighted average cost of capital [WACC] it is good news. In this case the IRR is 4%. That’s bad news. The project only has a 13 year term so FRV is taking some risk for the back half of the project. The cost of capital is a bit controversial. We believe most of the corporate community is used to a cost of equity of 9-10 per cent. Most management grew up when interest rates and inflation were higher and just don’t psychologically accept that returns are lower than they used to be. Still, if we plug the numbers straight out to the textbook with the only two assumptions that the beta is 0.7 and debt weighting is 1/3 we get a WACC of 5.5 per cent. Even so Clare doesn’t cover its cost of capital. For a 100MW wind farm located in, say the New England region of NSW, and getting a capacity factor of 35 per cent we estimate an IRR of around 5.6 per cent – so right on the cost of capital. 1. The panels last 25 years with output degrading 0.3% per year. 4. Capacity factor is about 14.5% (annual output as a percentage of stated capacity operating 24 hours a day, 365 days a year). 5. The cost of capital is equal to the investment loan bank rate or about 4.5% We will assume its not tax deductible, if it is the numbers are even better. We then model out the required cost of solar to break even using Net present value analysis at as low as $88MWh. This is an astonishingly low figure but simply reflects that the cost of capital (the borrowing rate is very low). The payback period is 15 years which is a long time by conventional standards. Again the message we want to emphasise here is that borrowing rates and the cost of capital are very low. In theory this means that projects with long payback periods by historic standards are still economic. In reality the household mostly installs solar as an “avoided cost”. The self generation means that electricity doesn’t have to be paid for. Electricity purchased from the grid costs the average household about $250 MWh ($0.25 KWh). Not all electricity can be self consumed; some has to be sold back to the grid and your friendly retailer will pay around $0.06KWh . Still, on the calculations above even if 90 per cent of the electricity was sold back to the grid (most unlikely) installing rooftop solar is still a good idea. Bottom line. It’s almost certainly worth installing rooftop PV provided you can get a decent capacity factor and can borrow at 4.5 per cent. Some sensitivities around these numbers are shown below. The key insight is that it’s the cost of capital, and the capital cost that drive renewable economics. Not nearly enough attention is paid by the industry, or by those that set policy, to the wonderful opportunity renewable energy has because of the low cost of capital that exists all over the world. Is Dubai's new record about to set a new normal for solar tariffs? With respect to your ‘gilding the lily’ comment, why indeed would FRV proceed with the Clare solar farm if the IRR is as you calculated? But also, why self-subsidise an (assumed) independent project at all? And on the comparison with wind, wouldn’t solar generally have lower capacity factor risk (due to better energy resource data)? Would this be sufficient to give it a lower ‘hurdle’ IRR than for wind? You might lock in a PPA covering both solar farms, if it would enable you to sell them after completion and get your capital invested on the second one back early. Hi David, My experience with household solar PV economics is the installed capital cost is lower than $1.60/W (after STCs) assumed. Latest quotes using mid-tier products across Perth / Melbourne ~$1.00/W (even lower dependent on brands and discounts offered by solar installer, $0.90/W). Can be a little higher ($1.10/W) if you want different modules / inverter. I would be interested to see your updated analysis using these capital cost assumptions. Yes you wouldn’t go above $1.30W (after STC) for standard install with quality components ie Fronius / SMA with Trina / Ja / Jinko / REC panels. The range is $0.90/W (True Value Australia’s largest installer) –> $1.30W (Premium install premium panels). 10 -11c /kwh FIT gives all roof owners, commercial and residential, a strong incentive to install. We need every available roof put to the task, no time to waste. This would mean FRV’s equity is c$16m. Where are you getting your figure of $115m from? Yes. I made an error transcribing the number. Thanks for the correction. David – great set of articles to-date – well done. Please keep it up. You are spot on in your conclusion that the historically very low cost of debt finance for owner-occupiers is not well understood by policy makers in Australia. This will have profound implications for the take-up rate of residential battery storage as well. The availability of record low interest rates for 25 year durations is key to the record low US$30/MWh Dubai solar contract this month. The collapsing cost of solar PPAs in India also reflects the progressively lower cost of finance there as well. As a solar producer to the Grid im very upset as from the end of this year Ill get nothing for the Energy I feed into the grid . My Solar unit 20 years ago cost $50,400 to install plus 2 new meters within 12 months i had to pay for plus having them wired in . When this happens Ill still be charged my grid fees even though Ill go off line as I have Wind backup and a Solar tracker to provide me with my Maximum output as long as their is some sun. I can control my grid feed to run consistently at 5 kilowatts during daylight hours . I can either charge my battery backup or of track the sun to limit my supply into the Grid . 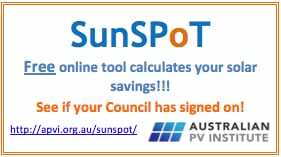 What do all on this site think about the end of the solar Rebates and energy buy back under this Lousy Liberal National Government . Vote 1 Labor all over Australia in All elections if not Vote Progressives a Totally New party That’s For the people not a Few elete. Tracking down someone who does something similar in terms of a computer managed link to your grid supplier to maximise the amount paid for power fed in might be an option. Is pitting wind and large scale solar head to head fair when the two have complimentary generation characteristics? In a scenario where solar deployment, distributed and large scale, tends to meet or exceed daytime peak demand the value of solar generation drops to zero. Wind on the other hand continues to generate electricity at times when solar is unavailable. Distributed solar always has value to the behind the meter owner and network power has to compliment that. It is often overexaggerated just how well solar is doing but it is undeniable that if the current trend can manage to continue it will be a major power source within a decade. I would argue than solar power is more valuable than wind due to its daytime production. If the premium price for solar versus wind increases by just 1% p.a. then the IRR increases to over 5% and therefore comparable with wind.